What does it take to get a scientific theory accepted? Hard facts? A strong personality? Grit and determination? For many Earth Scientists today it can be hard to imagine the academic landscape before the advent of plate tectonics. But it was only fifty years ago that the theory really became cemented as scientific consensus. And the clinching evidence was found in the oceans. Alfred Wegener had proposed the theory of continental drift back in 1912. The jigsaw-fit of the African and South American continents led him to suppose that they must once have been joined together. But in the middle of the century, the idea fell out of favour; some even referred to it as a “fairy-tale”. It was not until the discovery of magnetic reversals on the seafloor in the early 1960s that the theory began to sound plausible again. If brand new ocean crust was being formed at the mid-ocean ridges, then the rocks either side of the ridge should show symmetrical patterns of magnetism. Fred Vine and Drummond Matthews, geologists at the University of Cambridge in the UK, were the first to publish on the idea of seafloor spreading in 1963. But plate tectonics was still not the only theory on the market. The expanding Earth hypothesis held that the positions of the continents could be explained by an overall expansion in the volume of the Earth. Numerous twentieth-century physicists subscribed to such a view. Or, similarly, the shrinking Earth theory proposed that the whole planet had once been molten. Mountain ranges would then be formed as the Earth cooled and the crust crumpled. Weissert especially remembers Rudolf Trümpy, professor of Alpine geology at ETH at the time, saying that plate tectonics sounds interesting, but it does not work for the Alps. Meanwhile, younger voices at ETH, postdocs and lecturers, were becoming increasingly convinced by plate tectonic theory. Weissert soon found himself in the midst of the controversy as his own research had a direct bearing on the debate. “I had an interesting diploma topic,” says Weissert. “I worked on continental margin successions and associated serpentinites.” Serpentinites are green-coloured rocks that are full of the water-rich mineral serpentine, and therefore must have formed on the ocean floor. The fact that Weissert was finding them in Davos, at the top of the Alps, was a good indication that modern-day Switzerland had once been part of the oceans. As Weissert succinctly puts it, “green rocks were ocean”. By 1967, interest in the theory of plate tectonics had snowballed. When the Deep Sea Drilling Project (DSDP) was launched the following year, it had its sights firmly set on finding evidence that would definitively either confirm or reject the hypothesis of seafloor spreading. 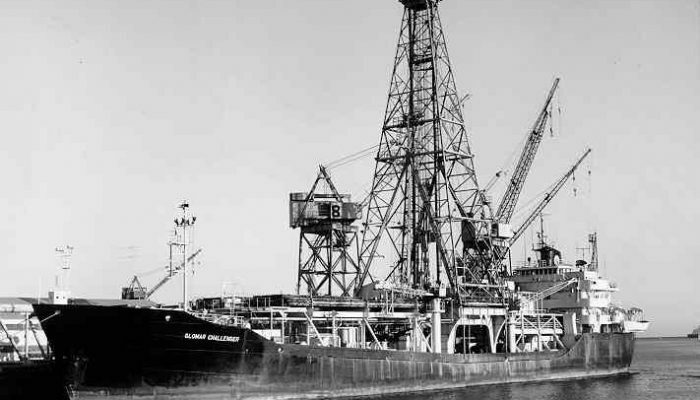 The DSDP research vessel, the Glomar Challenger, set sail from Texas in March 1968. By its third leg it had drilled 17 holes at 10 sites along the mid-Atlantic ocean ridge and was already producing results that looked like they would confirm Wegener’s theory of continental drift. “After a few legs it was clear that the seafloor spreading hypothesis was tested and proven,” remembers Weissert. There were only eight scientists on board, but two or three of them were working on the stratigraphy of the seafloor sediments. “The stratigraphy was superb,” explains Weissert. “You have the very young [sediments near the ridge] and then at the edges of the ocean the Jurassic sediments. 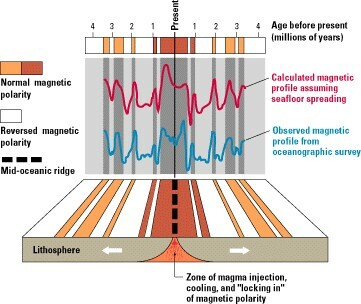 If you have aging crust then you have aging sediment, so the hypothesis was very clear.” If the sediments got progressively older on moving away from the ridge, then so must the crust, a sure sign that new ocean floor was being created at the ridge. Indeed, many years later, in 2001, Trümpy wrote what Weissert calls “a beautiful small article” entitled Why plate tectonics was not invented in the Alps. Trümpy magnanimously writes, “Shamefacedly, I must admit that I was not among the first Alpine geologists to grasp the promise of the new tectonics.” And yet, he continues, “to the Alps, plate tectonics brought a better understanding”. The humans and the science move on together. Trümpy, R., Why plate tectonics was not invented in the Alps, International Journal of Earth Sciences, Volume 90, Issue 3, pp 477–483, 2001.